I have a big backlog of audio books downloaded for review - I always have one going, but there still isn't enough time to read/listen to all the books I want to! So, often when I start the next audio on my list, I can't remember why I chose it or what it's about. It was like that with The Lightkeeper's Daughter by Jean E. Pendziwol, but this engaging story of two intertwined lives set on the Canadian side of the Great Lakes quickly pulled me in. Elizabeth is an elderly woman living out her days in a fancy retirement home. Her mind is still sharp, but her eyesight is mostly gone now. She grew up on a little isolated island in Lake Superior where her father was the lighthouse keeper, and her father's old journals have recently been found. Elizabeth would love to read them because she still has some questions about secrets kept from her as a child, but of course, she can no longer read herself. Morgan is a teen girl in foster care who was sentenced to community service at the retirement home for some graffiti she painted there. While she is repainting the fence, Elizabeth hears her (and some haunting music that sounds familiar coming from her iPod) and begins to talk to the reluctant girl. The two form a tentative relationship, as Elizabeth asks Morgan to read her father's journals aloud to her. Bit by bit, the story of Elizabeth's childhood emerges from both the old journals and Elizabeth's own memories, while the reader also learns more of Morgan's background and story, too. The unlikely pair gradually become friends and discover a connection between them, though they don't yet fully understand it. The narrative moves back and forth between Morgan's current life and Elizabeth's past, in a way that reminded me somewhat of Orphan Train (which also connected the lives of a teen from foster care and an elderly woman). 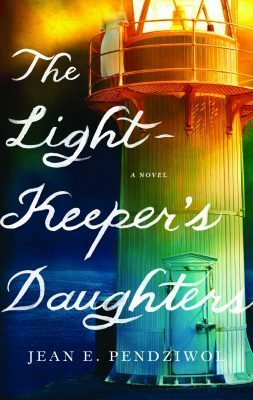 The author paints a vivid picture of the unique life of a lighthouse keeper and his family in the secluded world of their small island, as Elizabeth and her siblings explore the natural world around them. The story is immersive and compelling, but it is also suspenseful, as Elizabeth gets closer and closer to learning the secrets from her childhood and how she and Morgan are connected. Filled with emotional depth and compassion, this novel also has plenty of surprising twists and turns in store! I especially enjoyed listening to it on audio, brought to life with three alternating narrators. NOTE: This is an adult novel but will also appeal to older teen and young adult readers. Listen to a sample of the captivating audio book (the sample is from the beginning of the novel, one of Morgan's sections). Or order The Lightkeeper's Daughter from Book Depository, with free shipping worldwide. I like multigenerational storylines and how they tie experiences, generations, and family together. I'm glad you liked this one. Me, too! This one had a lot of surprises, too. This sounds like something I would like--great review. Hope you enjoy it, too, Jane!